Have you heard about it? 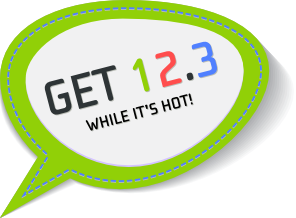 openSUSE 12.3 is out! I did an upgrade earlier today on my main laptop (with a simple zypper dup after having updated the repos configuration, which went surprisingly fast), and this release looks great! But the best part: it comes with OpenStack love! For the first time, an openSUSE release provides a fully working set of OpenStack packages. We had some OpenStack packages in the previous release, but they were not in such a great shape and some components were even missing (although we fixed that later on with packages in the build service). With 12.3, you can finally enjoy OpenStack with the Folsom release in a very straight-forward way, and therefore you can easily deploy your own cloud. The packages that we provide are built from the stable/folsom branch, and there's an online update coming soon so you can enjoy the stable/folsom code as of end of last week. To help people who might not want to learn everything needed to properly deploy OpenStack, we also have a small openstack-quickstart package, that comes with a script that can be used to deploy everything locally. It is obviously not recommended to run this on your main computer (I usually run this in a virtual machine), but it gets you quickly to the point where you can play with OpenStack. Of course, Folsom is relatively old at this point and the new version, Grizzly, is to be released in three weeks. But don't be sad! We've been working on Grizzly packages for some time now: you can grab them from the Cloud:OpenStack:Master project in the build service (hey, look, it's even building packages for SLE and openSUSE 12.2! the build service is a rather convenient tool!). I guess we'll properly move them to Cloud:OpenStack:Grizzly once Grizzly is officially released. I mentioned a few months ago that I had finished porting DevStack to openSUSE 12.2, and I wrote some small documentation on how to use it. 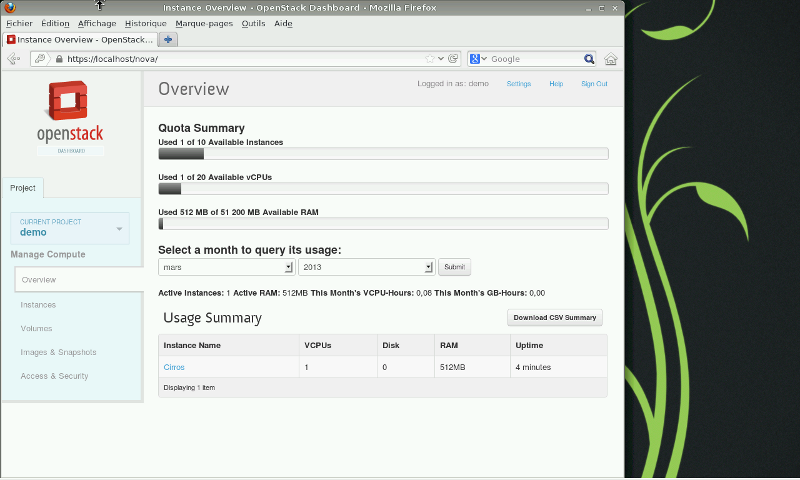 It's really a neat tool, both for playing with OpenStack and for developing for it. However, I realized earlier this week that I had never double-checked everything was still okay for 12.3. It turns out there's a small issue that completely breaks it, oops ;-) But once the fix is checked in, DevStack will be usable on the latest openSUSE. I'll do some more tests before marking this version of openSUSE as supported in DevStack, but that shouldn't block anyone from using DevStack on 12.3. We're pretty open about how we develop OpenStack in openSUSE. Andreas wrote a post about all this a few days ago. We've opened up (or rather, revived) a mailing list dedicated to the cloud recently, which developers, packagers and users can all use to discuss OpenStack. And unsurprisingly, we also have an #opensuse-cloud channel on Freenode. But most importantly, we've worked on making public the infrastructure we use to build OpenStack for openSUSE. I think the important bit on this is that everybody is able, and welcome, to join this effort. It's not just about being able to say "see, we have OpenStack"; it's about building a rock-solid experience for OpenStack, and enjoying doing that!